I was browsing some food pictures on pinterest, when I came across this recipe for : Oreo Cookie Cupcakes. I could of literally of licked the screen they looked so nice. Oreo’s are a bit of a weakness for me, and here in Canada we get so many different flavours, including candy cane ones at christmas and pumpkin ones for the Fall – yum!! 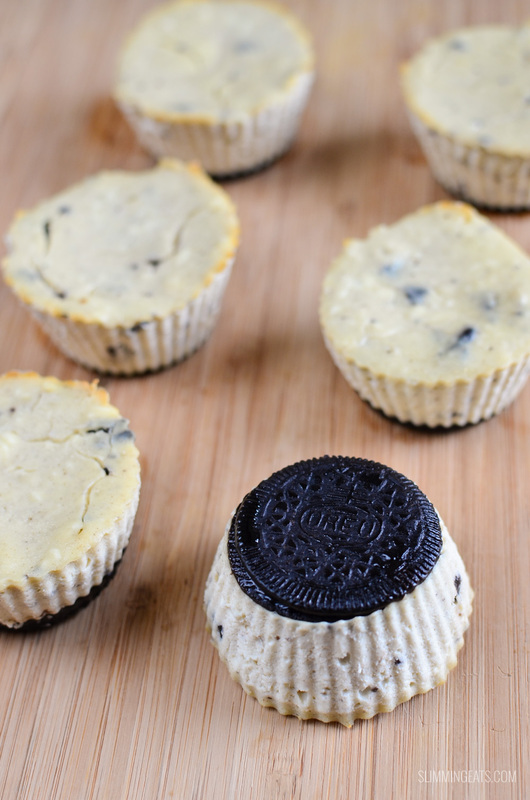 and these low syn Mini Oreo Baked Cheesecakes are delicious!! and as they are only 3.5 syns each, it means you can enjoy 2 or even 3 and still be within your daily syns. Regular paper muffin cases will work fine too, I just like that these are reusable. 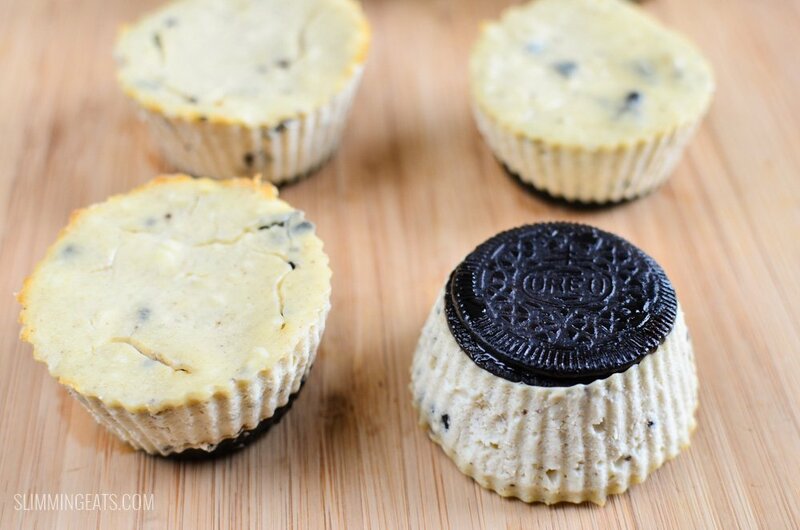 To sweeten these Mini Oreo Baked Cheesecakes, I like to use Sukrin: 1 which is a great natural tasting sweetener. I have tried many different types of sweetener in the past trying to find one that is natural and tastes natural and I think this is it. I usually just use some syns on honey or maple syrup, but it’s nice to know I can now use this and reduce the syns even further. Instead of sukrin you can use any sweetener of choice of course. 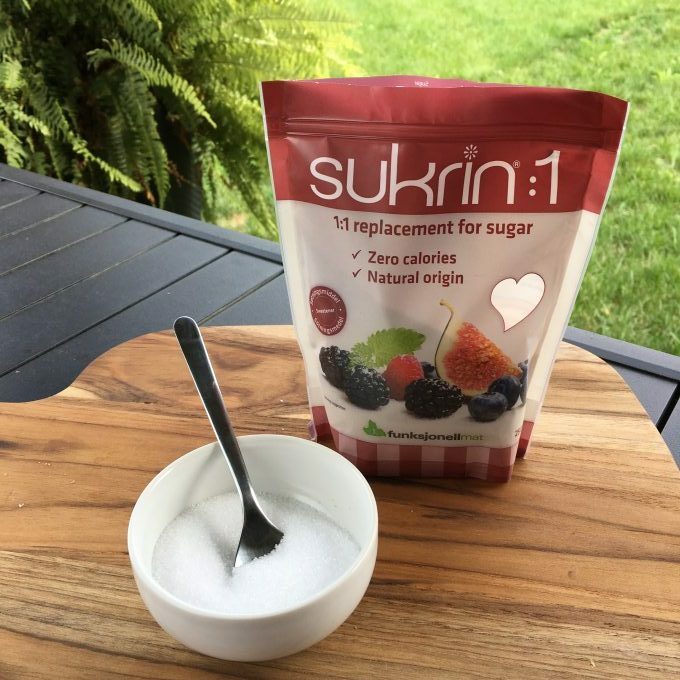 But I can’t recommend sukrin enough, it tastes so good in baked goods and is by far the best tasting natural sweetener I have found. NOTE: For those in the USA and Canada there is now also a similar sweetener called Swerve that comes in a white granulated sweetener and an icing sugar, that are natural and like Sukrin, have no aftertaste. Unfortunately they don’t carry a brown sugar version, but the white granulated is on par with Sukrin. For those in Canada – Swerve can be purchased at most loblaws stores in the health food section. Also don’t forget that Slimming World have recently made some changes to sweeteners and any time you use a tablespoon or more, it should be synned at 0.5 syns per tablespoon, this is to protect your weight loss. These Mini Oreo Baked Cheesecakes should keep a couple of day in the fridge, mine never last more than a few days. Line half a 12 space muffin tray with paper muffin cases. Place one Oreo cookie in each case. In a large bowl, whisk together the Quark and splenda until smooth. Then add the vanilla essence and slowly whisk in the egg. Add the two remaining Oreo cookies to a food bag, and bash until they are in small crumbs. Add this to the quark mixture, and mix thoroughly. Pour the mixture into each individual muffin case equally and baked in the oven for approx 25 mins (filling should be set). Allow to cool and then refrigerate for approx 4 hours at least before serving. These are yummy and I can’t wait to try some more variations on these. I have been waiting to go shopping to try your baked cheescake recipe, not waiting no longer lol. Going to pick up some Quark tomorrow. Look lovely! they were divine and well worth 3.5 syns each. Gemma, use a different biscuit then? I made these the other week and they were a big hit even with non dieting hubby and daughter. Im making them again today but with party ring biscuits which makes them even lower syn i believe – yey! Im from the UK and our Quark comes in 250mg tubs? I’ve googled a few sites looking for conversions without a definitive answer…. can anyone tell me how many grams/ounces/pounds 300ml is? I would say you need at least 1 1/2 tubs. 300ml usually equals 300g, but it can vary depending on the type of ingredient it is. Omigosh. 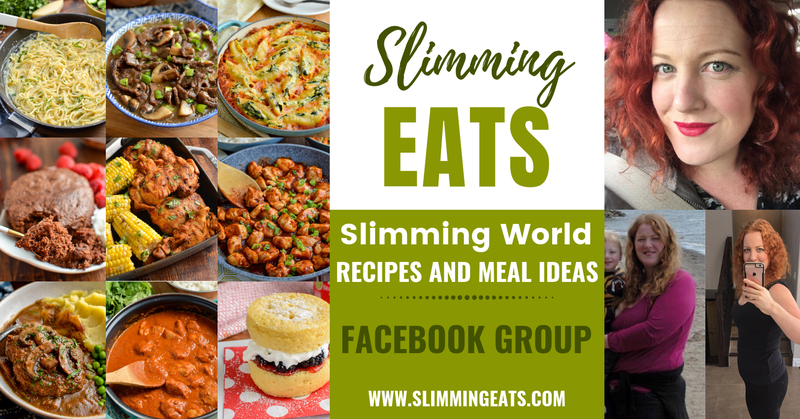 Iv just made these for the slimmingworld party were having tomorrow. Iv just tried one to ‘test’ – flippin gorgeous. How will i not eat the rest before tomorrow???!!! hi Hayley,when you say half an oreo was it the plain half or with the cream on i carnt wait to make some…. I made these the other day and they were nice but i was wondering what it would be like with peppermint essence instead of vanilla to give a nice extra taste. 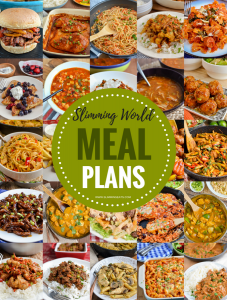 I am new to slimming world (and baking!) and i was wondering if anyone had any opinion on it and whether it would work?? Have just made these and don’t know if I can wait the 4 hours they need to set! I made these yesterday as well as one of your quiches, they are so nice. Thank you for the recipe! well i got 12 cakes out of this recipie! !cant wait to eat them!! Came across this recipe and thought I’d give it a go, absolutely lovely! Halved quantities to make 3, needed a bit longer to cook in my over but soooo worth it! These look amazing! Can’t wait to try them! Should I use a cupcake cases or muffin ones? cupcake cases should be fine – enjoy!! How many grams in 1/4 cup of sweetener please ?